Located in the heart of Joshua Tree Village, this home is the perfect get-away spot for business or pleasure. Easy access to the JTNP West Entrance or walk a few blocks to experience the local flavor of Joshua Tree with eateries, shops, art galleries, music venues and a Saturday farmers market. The house is well suited for couples, gathering friends and rock climbers. Fully prepped with everything you'd need for your escape to the desert. Let the Sunset Roost be your destination home! The house is clean and well appointed sleeping a maximum of six with two bedrooms (queen beds) an Olympic Queen (a tubby-queen) sleeper sofa for when your group needs just a little more space. When you're not exploring you can sit back and relax in the family room with Hi-definition SmartTV including CableTV and a Netflix account. The hi-speed WiFi is capable of streaming, surfing, or when you have some pesky work to deal with. A common draw to the desert isn't just for the beauty, but for the climate. We are fortunate to have some of the most spectacular weather in the US with mild months requiring nothing more than an open window. In warmer months, we have a ducted evaporative MasterCool system along with various ceiling/room fans. For the short-days of winter, a gas wall-heater along with cotton quilts and linens will provide you the coziness you want. The home has plenty of windows with both sunscreens and blinds. As guests, you can select natural light, privacy or the controlled darkness you prefer. The fully appointed kitchen allows you to cook meals, the ever important hot cup of Joe and really relax after hiking and exploring all day. When your days are long, feel free to pack a picnic using supplied baggies, ice-chest and freezer packs. Our kitchen features all the modern conveniences so meal prep and cleanup are a breeze whether for yourself or your group. Outdoors you'll find various seating options, patio table, gas BBQ and private fenced yard. This outdoor living space will provide you a great place to hang-out, have cocktails, conversation, and a little fire while enjoying the sweeping views of Joshua Tree. We even provide the wood for use in the wood burning stove! Location makes the Sunset Roost an ideal setting for your upcoming visit. The proximity to Joshua Tree Village will set you in the heart of what's happening both day and night, yet the privacy to relax in peace and quiet. All the while you can relax with a hot shower and the electronic conveniences we so often seek. Eat at home, pack a lunch or walk down to town for some amazing local cuisine; the choice is yours and we welcome you as guests. The Joshua Tree National Park visitor center is only 1/2 mile away and an easy walk. Sunset Roost is ideally located with the Joshua Tree National Park West Entrance Station just 5 miles to the south. During busy season, we suggest access through the North Entrance located just 20 minutes east in Twentynine Palms. Music venues such as Pappy and Harriets is 12 miles away; those attending Bhakti Fest, Desert Daze or other events held at the Joshua Tree Retreat Center is a four-minute drive towards Yucca Valley. When attending the Joshua Tree Music Festival or ClimbSmart venue, a quick six mile jaunt will get your there. Ease of hiking and exploring couldn't be better with the Indian Cove Campground, 49 Palms Oasis Trail, and Desert View Conservation nearby. Recommendations for Pioneertown, Landers Brew, Giant Rock, Gublers Orchid Nursery and the Integratron are easy excursions when staying at the Sunset Roost. "The four of us had an amazing weekend at the Sunset Roost. The rental was the perfect home base for our weekend exploring Joshua Tree. The house was very clean, the beds were so comfortable, and located just a block from downtown and a few miles from the entrance to the national park, we could not have asked for a better place to stay. The new kitchen appliances/pots and pans made for a wonderful home cooking experience and we were all able to stay warm and dry playing games in the family room while it poured outside. I would book the Sunset Roost again in a heartbeat. A big thank you to Susan for being so accommodating." "Cozy casita with a nice view towards the park. Close to town, but on a quiet street. Close to park entrance for quick access, enjoyed our stay!" "This house was really perfect! VERY CLEAN, VERY COMFORTABLE, very private, easy to find, close to Joshua Tree SP, as well as other really great activities outside the park. Susan's communication was warm and welcoming as well as clear about how to access the house, etc. If you're looking for a place in JT, this house is a no-brainer... enjoy!!!" "Susan was awesome- very communicative and easy to work with! The location of the house was so perfect for Desert Daze and walking distance from the main street. Joshua Tree is so cool." "This is a quaint house very close to town. Completely updated. Everything you could ever need. We were there over a week. Been to Joshua Tree several times - and this was by far the best place!!" "Susan is very helpful & responsive. She really knows the area well! This house has everything you need & is very convenient to DT JT." 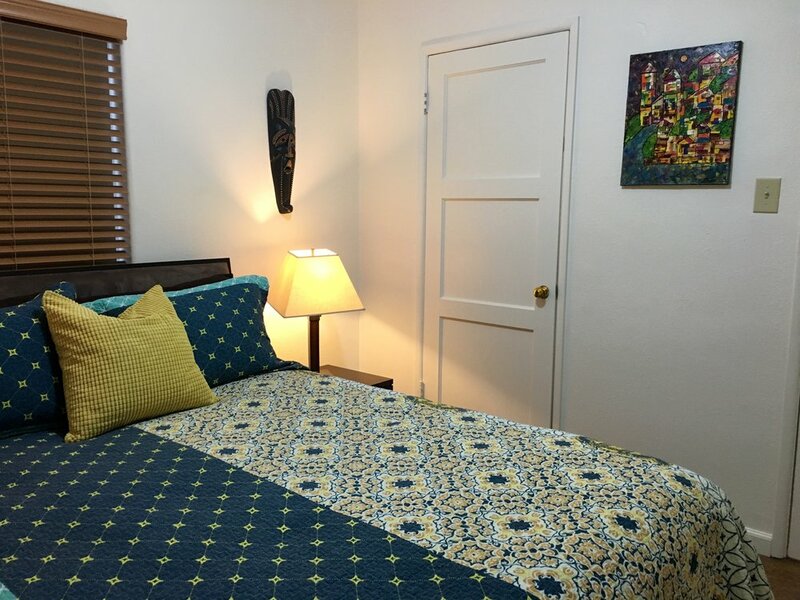 "Excellent location within a short walk of downtown Joshua Tree Village. Comfy beds and gorgeous backyard. Wish I could have stayed longer!"